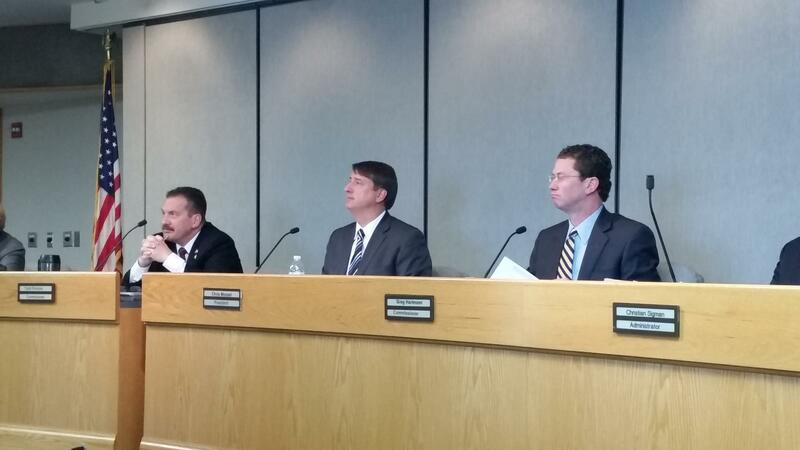 Hamilton County Commissioners (L-R) Todd Portune, Chris Monzel, and Greg Hartmann. "This budget will also require no increase in sales or property taxes for Hamilton County residents in 2015," says Monzel. "In fact, property taxes will be decreasing because the Union Terminal property tax levy (will) expire at the end of December." Budget highlights include a five percent rate increase for police and fire agencies who use the county dispatch center, more funding for economic development programs, and money to consider consolidating county facilities. It also includes two months of carrying costs on the former Mercy Mt. Airy site which the board still hasn't decided if it will accept. Commissioner Greg Hartmann says the plan is the best the county can do. "It makes lemonade out of lemons, I think," says Hartmann. Hartmann also thanks the Sheriff for agreeing to contribute $1 million from his restricted fund to bring the Sheriff's total budget to $63 million, which is in line with current spending. Police and fire groups don't like the dispatch rate increase. Green Township Police Chief Bart West told commissioners during a public hearing Wednesday, "It would hit police agencies very hard. For our budget, a five percent increase would increase our budget by about $14,000 a year." Speaking on behalf of the Hamilton County Fire Chief's Association, Springfield Township Fire Chief Robert Leininger agreed with West. He added that a 911 Preservation Task Force is working on a plan for communication solutions and plans to present something soon. Commissioner Todd Portune says seven years of austere budgets have left the county with nothing left to cut. "We have done much, much, much more with less," says Portune. "But we're at a point where the only thing you can do with less, is less." Portune recommends getting rid of some property tax levies and using a quarter cent sales tax to balance the budget and fund some of the aforementioned programs at higher levels. Hartmann and Monzel won't support a sales tax increase.